Bhojpuri actress Monalisa aka Antara Biswas is leaving no stone unturned to impress her fans with her stint in the supernatural show Nazar. Earlier today, January 30, she took to Instagram to share her beautiful pictures as a vibrant bride. In the pictures, the gorgeous lady is seen donning red and golden bridal lehenga teamed up with bridal jewellery. The drool-worthy pictures will take your breath away. 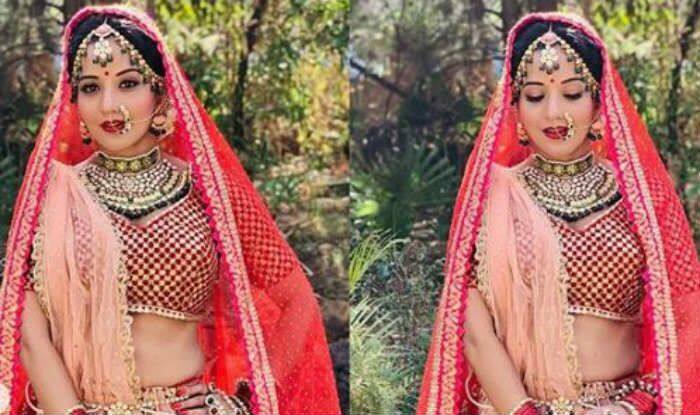 Her latest bridal look is from the show Nazar and we wonder what new interesting twist makers are planning to bring on the show. Earlier, she has shared her picture in a strapless purple dress and looked drop-dead gorgeous in the western avatar. A few days back, she has shared a series of pictures with her husband Vikrant Singh Rajpoot. The couple was spotted spending their Sunday together and looked adorable in the selfie.